Solid food, cozy and eclectic atmosphere and a pleasant manager (although the brunette server today with short, crimped hair could have been less brusque). Ditto to the bearded guy at the till; a smile wouldn’t hurt. I’m also dinking a star because the skinny turmeric chai latte I got, although large and colorful, was pretty tasteless. However, The Clementine- The Full Veg English- was delicious, especially the mushrooms and two veg patties that accompanied the order. Very savoury and incredibly filling without being too overstuffed. The meal also came very quickly after we ordered. I also love you can bring small dogs inside; I petted a Boston terrier, beagle and chihuahua all within a half hour :) The tables upstairs are pretty squished together so be aware. One of my favourite places in London for tasty brunch and great coffee! Few minutes walk from Finsbury Park station, this cosy coffee shop serves a great selection of breakfast/brunch dishes as well fresh bakery/pastry delicacies. Spacious garden area in the back is just the ideal place to read your Sunday newspapers on a sunny weekend! I love this place, i lived close when it opened as a coffee shop and seen it flourish to a full blown cafe. Its garden needs abit of work but I'm sure thats on the cards. Loved the breakfast and their coffee is amazing! First sign of gentrification for any area, the rise of the artisanal cafe. Industrial chic, with bohemian decor; you are free to drink a mug of tea stamped with the queen's face, whilst chewing down a croissant under WWII planes overhead. Not your usual eatery around here. The coffee was smooth, and almond croissants were fluffy; embrace the lightly roasted smell of the future Finsbury Park. This quirky little café tucked away on Finsbury Park's up and coming Blackstock Road is a little treasure trove of Great British culture. Adorned with all sorts of paraphernalia, including model planes and an Anderson shelter, you could be forgiven for thinking you're in a homage to WWII. Friendly welcoming staff will be ready to take your order, whether that be a cup of their own roasted coffee or something to fill your belly. Take a stroll up the stairs into the tardis, upstairs opens into a large room and a fantastic little roof garden. The Winston (aka full English brekkie), is the real star of the show complete with homemade baked beans and bone marrow (amongst the usual stuff). Definitely check it out! Delicious bread and wholesome food; just like being at home; relaxed and good wifi. Great staff. Lovely food. Good ethics. It's great! Ed Yarnton, the manager, is super welcoming and makes the whole place brighter! Great venue and laid back atmosphere. Comes well recommended! Great community cafe, coffee and staff are equally superb and you can spend hours here just chilling out!!! Love this place! Great bread and coffee. The staff are really friendly. Despite the war theme, the atmosphere is great. Best coffee in London, hands down. Flat White & Eggs Shropshire, nuff said! By far one of my favourite places in London! Best coffee shop in finny p - impeccable service, breakfast and coffee. Always go back to Blighty...! Really good coffee and lovely vibe. The Blighty coffee is a very surprising place 3mn away from finsbury park station. At first sight, you'd think that this is a coffee shop but it's so much more!!! 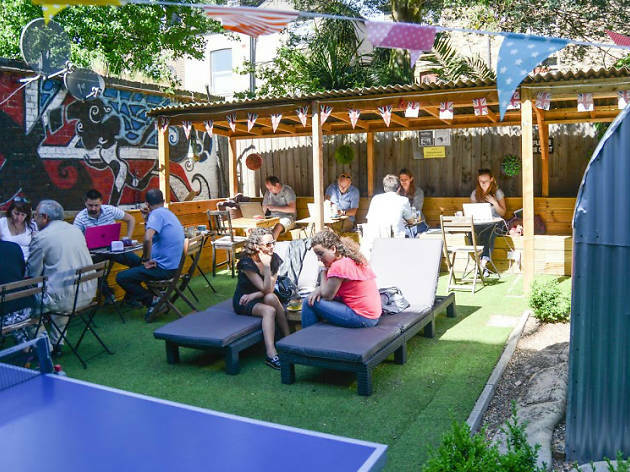 If you get in you'll actually discover a huge place with different atmosphere : the front coffee shop, the cosy lounge rooms and the sunny secret garden with tennis table! This coffee/restaurant place is super dynamic and can be a delicious breakfast restaurant (pictures as proofs below) with very reasonable prices (£8 for the super tasty eggs Linconshire and £9.50 for a full English), as well as a drawing or yoga (yes, YOGA!) place on Thursdays or just a very welcoming/relaxed/homely place to spend rainy Sundays in good company. To sum up: highly recommended "chameleon place"! A friendly and eclectic coffee shop. The best coffee I ever had !!!! Food is great. Very friendly staff. 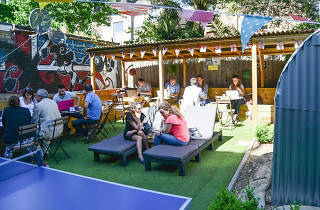 Excellent for a catch up or doing some work - especially love the garden out the back which also has a ping pong table. The cakes are awesome. Good coffee! They have proper iced coffee, which I love. But the breakfast... Wow! So good!! One of the best breakfasts in London. While the menu may not be extensive the food is fresh and delicious. The coffee is the best and they have a great garden out the back plus free wifi. A true hidden gem! My favourite coffeeshop in London. Coffee is brilliant (they roast own beans) and service is excellant, kind and friendly. They have an amazing brunch menu and the best ever full English. And an air raid shelter in the massive rear garden! A beautifully executed nod to the coffee shops of old. A friendly cafe with a limited menu but what they do they do well. Lots of comfy chairs and cosy corners make this a pleasant place to while away the hours. On sunny days the garden at the back is a sun trap.